Then, a brainwave hit. Ouch. The answer to my puzzle is ‘one of England’s Premier Wine Producers, ‘Chapel Down’. Last year they introduced a new brand called ‘Curious Drinks’, which, guess what, produces cuddly, lovely beer. The range is brewed by Everards; the Leicester-based brewer, under close supervision from the guys at Chapel Down. The reason, I imagine, is to test the water in brewing before jumping in and building a brewery at their enormous visitors site in Tenterton, Kent. Their flagship ‘Curious Brew’ is a malty, dry lager re-fermented with Champagne yeast. This yeast gives the lager a large-bubbled head that dissipates quickly. A 'dosage' of the refreshing Nelson Sauvin hops from New Zealand demonstrate this is a beer brewed with winemaking principles. There’s definitely a presence of the champagne character both on the nose and the initial taste. Its dry, refreshing, and is everything you want from a niche lager. The second beer is an amber-coloured, triple-hopped IPA, with a beautiful buttery-caramel flavour that hits you straight away. It’s similar to the taste sensation of an un-oaked Chardonnay (maybe I do know a thing or two, eh?) and after initially thinking it was the weakest of the three, it’s now my favourite. There’s almost a smoky, whisky character to it. It is, however, more Pale Ale than IPA. The third is the ‘Curious Porter’; a toasty, warm London-style dark beer, matured on oak chips with a burnt hazelnut flavour. It’s a lot fresher and cleaner than a lot of Porters out there, and I finished the bottle wanting another 3 or 4. As Darren, the Sales Manager for Curious Drinks and I agreed, the word ‘Craft’ is ambiguous. For me it’s a beer produced with good values & ingredients with a strong niche brand and demonstrates brewing talent. For others it’s a beer that is produced on a small scale by a few guys in a converted shed with a couple of vats. Truth is, it’s both of those things, and it’s not about persecuting bigger companies for introducing beers with those values. Chapel Down have demonstrated that they can turn their hand to Craft brewing, and with the addition of a Curious Cider coming at the tail-end of the Summer, they are really pushing their new brand. 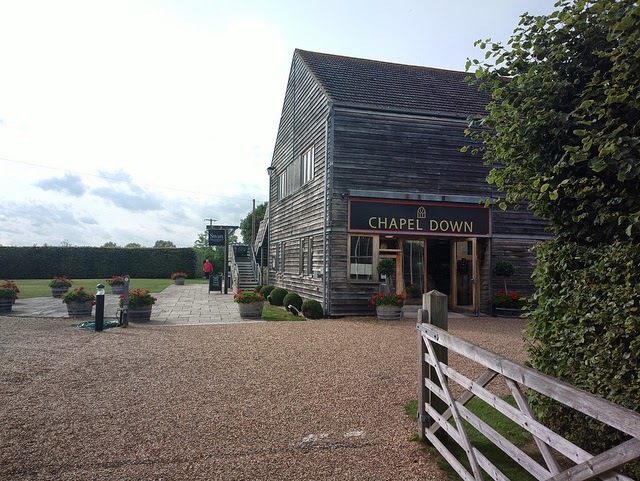 Chapel Downs’ share prices have struggled in recent years, and I cant help but think their venture into beer provides the company with a more consistent revenue stream; they’re not reliant on grape harvests, which, apart from 2013, have been pretty bad in recent years. I loved the range; the Porter and the IPA in particular. ‘Curious’ is a strong brand and they aren’t diluting it with numerous brews, but instead sticking to three (soon to be four) core products that work really well. I do wish that they’d rebrand the ‘fashionable at the moment’ IPA a Pale Ale and add a Wheat variant, but these beers are great. 'Curious Brew' is available throughMajestic, currently on Special Offer at only £14.99 for 12, and the 'Brew' and 'IPA' are available on draught in freehouses across our green and pleasant isle. You can also buy the Curious Beer range direct from Chapel Down's website - it's £36 per 24 bottles.